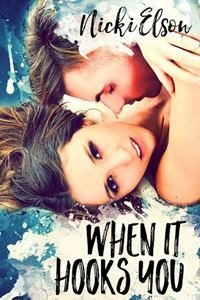 I was inspired to write this story because I wanted to show that even those confident, beautiful women who seem to have their every romantic wish granted are capable of getting their hearts crushed by love. Trish is a woman who hasn't yet met her match, so she thinks long-term relationships aren't for her. She's happy with her short-term, no commitment dating lifestyle – until, of course, she meets Adam. I also wanted to write a story containing a BIG surprise for readers. It was fun keeping Adam's secret while dropping clues along the way. I'm happy to report that so far, most readers have been completely shocked by the reveal. Trish revealed herself to me while I wrote her friend Lyssa's story. Trish is the confident, take-no-crap friend who always says exactly what she's thinking. Always. She's great at giving other people advice but not so great at taking it and is also extremely loyal. She's like a lot of women I know – the kind whom it's sometimes hard to be around because she steals all the attention, yet her friendship's pure gold. Adam had to be different than the everyday jock types Trish usually goes for – he had to be something special to make her drop all her dating rules to be with him. So he's the enigmatic businessman who travels more than he's home and only opens up in bits and pieces. But his entrancing eyes are expressive and fill in the blanks when Trish is unsure of how he feels about her. So far from readers' reactions, Cliff seems to be the breakout star of the show. He was initially imagined as a minor plot device, but he walked "on stage" and was so naturally fabulous, he instantly earned himself a larger role. As Trish approached the hand dryer in the office bathroom, she heard the faint tones of “I’m Shipping Up to Boston” floating in from the lobby. She’d left her phone at her desk and now rushed to answer before the song stopped playing. It was her new ringtone for Lyssa. “Hey,” she said, somewhat breathless. “Great. I’m packing my entire life and getting rid of what I can. A truck from the church rummage sale is stopping by at six to collect donations. Before I give it all to them, I was wondering if you’d want…” She went on to list various pieces of small furniture and accessories, only a few of which Trish said she’d take. From behind the highest frond, a man’s head emerged. His dark blond hair was straight and mostly swept back from his elegant, handsome face. As he leaned forward, a stray wisp fell over his forehead. Trish didn’t recognize his long, angular features. She guessed him to be in his mid-thirties at the oldest and noted a touch of suntan to his mid-tone complexion. His tall, lean form moved around the plant with his arms bent and hands half raised in surrender. “Talk to you later.” Trish clicked off the phone, keeping her gaze locked on the new arrival. His eyes darted away and Trish’s face warmed at remembering exactly when he’d cut her off. She’d initially assumed the throat-clearing had come from Levi or one of the building maintenance guys she often joked with. That would’ve been something to laugh at. Talking about shoving things into her naughty bits in front of a client she’d never met before, however, was nothing short of mortifying. “No, thank you.” He stayed where he was, not making a move toward the couches. His gaze fixed on her desktop. By the way the fingertips of one of his hands tapped against his thumb, she gathered he had something more to say to her. He lifted his eyes and she saw they were a light golden color with touches of green—or was that the hue of his suit reflected off them? She smiled in response, inciting his grin to grow larger. She wasn’t sure if it was because of her relief or the sudden warmth of his expression, but she felt drawn to the alluring man in front of her. There was something old school about his slimness and height, his crisp suit, and the formal way he talked. Yet the wisp of hair that he hadn’t yet smoothed back revealed an impish, less polished side to him. “Please, call me Adam,” he said. She laughed, caught in Adam’s amused gaze. She realized now that it was the intensity behind his eyes that pulled her in, making her more intrigued by him than their brief conversation should warrant.